Biographers, dealing as they are with lives passing (or gone), wrestle more than other writers with those inevitables: time and death. This spring, the great biographer Michael Holroyd told his Hay festival audience that biography lets a dead author write a new book. Animal Magic: A Brother's Story, reviewed here does just that. Andrew Barrow's brother Jonathan was killed at twenty-two in 1970 in a car crash, alongside his fiancée, days before Jonathan's wedding. Andrew's response was to let the years go by, take the dead man's surreal unpublished novel The Queue, and rework it into a highly original biography. He allows the prophetic facts of borrowed fiction (bride gets run over by a bread van) to echo real-life tragedy. The Queue, featuring as it does stripteasing daschunds and members of a menagerie in degrees of sexual arousal, together with Jonathan's Quentin-Blake-alike sketches of macabre subjects such as a dead horse with a hard-on, reveals a bizarre imagination of which his living brother is in awe forty years after his bereavement. In his memoir Ten Pound Pom (reviewed last time), Niall Griffiths looks down a slightly shorter telescope, over thirty years, and finds himself struggling more to face the present – Australian killjoys and a Magic Pudding diet – than the boy he was, intent in his discovery of dragon lizards and how wildlife may win over Mrs Finkelstein. Griffiths’ use of alternating ‘then’ and ‘now’ sections suggests disjuncture, as though light years separate the family’s emigration in 1976 from the travel journal of 2007. So does his juggling of the lad’s third-person ‘voice’ with the man’s (engaging, opinionated) first person. However, his decision to narrate across these sections in the present tense does the opposite, making a whole life accessible as a contemporary story. This technique certainly dazzles but it doesn’t hide our sense of Griffiths’ preferred timezone (then, if he must be Down Under) and continent (home, if he must be now). And how much did he fork out on excess baggage to wing that belly Waleswards? The memoir notes Montaigne’s account of a Swiss gravestone seen in 1580, inscribed with ‘a peculiar phrase: Here lies so-and-so, who was dead when time was passing through the year twelve hundred.’ A classic Gwyn riff on the personification of time ensues, sentences spooling out and wound tightly back in again. 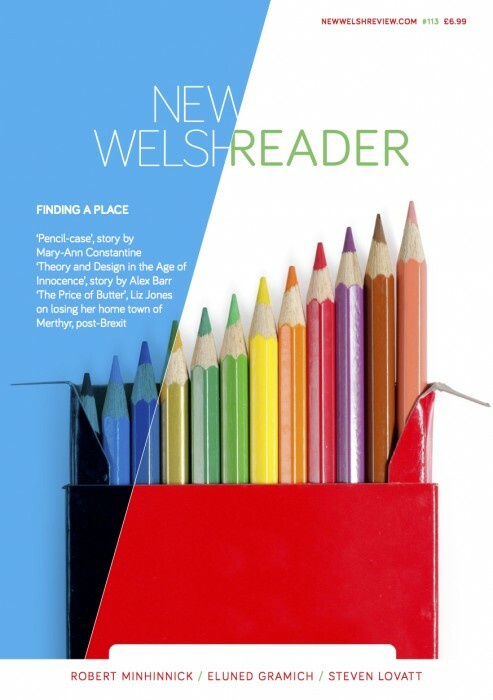 This issue gives further space to Gwyn to riff on Montaigne himself, rather than time, but we do return to our theme of biography, since, as Gwyn argues, the French aristocrat is credited with being the ‘father of the essay’, and specifically ‘self-reflexive prose in which the thoughts and actions of an individual constitute the subject matter and determine the direction of the writing.’ Should we blame him for ‘the contemporary infatuation with autobiographical writing; the glut of misery memoirs, “sick lit”, confessional and celebrity memoirs with which the publishing industry is obsessed, not to mention the contemporary trends of blogging, social networking and twittering’? Gwyn says not, but that ‘we might consider that in some important ways he started it all’. Submarine’s Oliver Tate should have a T-shirt logo-ed ‘self-reflexive’ (and he’d know what it meant) but being at once your own subject and your object goes with the teenage territory. Pretentious, interfering, ‘precocious… [and] emotionally illiterate’… what’s not to dislike about him? Liz Jones explains how Richard Ayoade’s rule-breaking film keeps Dunthorne’s confessional voice and even adds bookish tropes. More films and growing pangs with Tyler Keevil’s essay on the role of the soundtrack in coming-of-age films. Finally, in Reviews, Mike Parker’s state-of-the-nation piece looks at the gay community ‘precocious adolescence’, post AIDS-era.